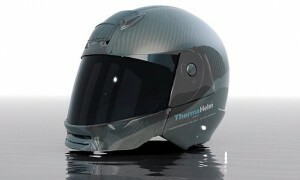 Original Article: Halo Helmet from ThermaHelm® is the most revolutionary and innovative redesign of the Motorcycle Safety Helmet in over fifty years. This has created a ‘paradigm shift’ in the market, because this unique life-saving technology actively helps protect your brain –not just your head, in the event of an accident.The first ‘Active Crash Helmet’. Trauma to the head in motorcycle accidents accounts for the largest number of deaths and is a significant factor in virtually all motorcycle accident injuries. Trauma causes brain swelling that needs to be treated as quickly as possible. Actively cooling the brain contributes positively to limiting neurological damage, preserving life and delivering the chances of a better recovery outcome by extending the critical Golden Hour. There are over 6,000 motorcyclists involved in a KSI accident (killed or seriously injured) each year in the UK alone. ThermaHelm® by Julian-Preston Powers patented technology combines two units of individually stored non-toxic components within the helmet lining. Sensors buried in the EPS lining of the helmet trigger a chemical integration upon impact, ‘activating’ a simple process which creates a controlled, cold (endothermic) state. 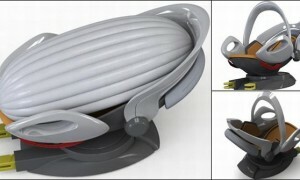 This cold cap surrounds the brain and cools rapidly giving precious on the spot relief to a potentially injured rider. A series of Patents and Trademarks protect the technology and company’s branding respectively in all parts of the world. Halo by Thermahelm incorporates a shell ofcarbon fibre significantly better than the plastics or polycarbonates used by Arai and Shoei because it is lighter, virtually impenetrable and flexible enough to absorb impact energy and spread it around the circumference of the helmet. Carbon fibre also looks attractive and ‘cool’. 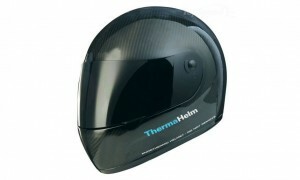 In addition ThermaHelm has the unique brain cooling USP device ThermaPak, and secondly the product will be offered with GPS technology whereby emergency services will be notified if a rider has an accident. 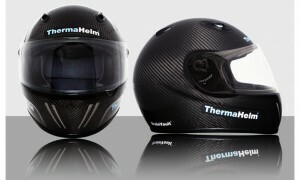 The ThermaHelm helmet weighs 1.5kg which is optimal (shell 1kg plus ThermaPak 0.5kg). In order to match this optimum weight using carbon fibre, competitor’s helmets would require padding with potentially unsafe ballast. To date they have not been able to solve this problem. 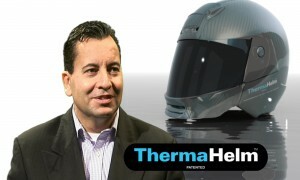 Self explanatory safety benefits of brain cooling within 3 seconds of Motorbike accident rather than waiting for emergency services to apply cooling devices once satisfied that there is no neck injuries.Halo Helmet from ThermaHelm® is the most revolutionary and innovative redesign of the Motorcycle Safety Helmet in over fifty years. This has created a ‘paradigm shift’ in the market, because this unique life-saving technology actively helps protect your brain– not just your head, in the event of an accident.The first ‘Active Crash Helmet’. Trauma to the head in motorcycle accidents accounts for the largest number of deaths and is a significant factor in virtually all motorcycle accident injuries. Trauma causes brain swelling that needs to be treated as quickly as possible. Activelycooling the brain contributes positively to limiting neurological damage, preserving life and delivering the chances of a better recovery outcome by extending the critical Golden Hour. There are over 6,000 motorcyclists involved in a KSI accident (killed or seriously injured) each year in the UK alone.ThermaHelm® patented technology combines two units of individually stored non-toxic components within the helmet lining. Sensors buried in the EPS lining of the helmet trigger a chemical integration upon impact, ‘activating’ a simple process which creates a controlled, cold (endothermic) state. This cold cap surrounds the brain and cools rapidly giving precious on the spot relief to a potentially injured rider. A series of Patents and Trademarks protect the technology and company’s branding respectively in all parts of the world. More timely application of recognised emergency treatment to victims of motorbike accidents, giving more time to treat patients and arguably reducing emergency trauma incidents for hospitals and other emergency services. Already has ECE2205 impact testing certification. Our founder is a member of the steering committee of UK Department for Transport’s SHARP helmet safety standard programme and the intention is that this will be the world’s first globally certified motorcycle helmet with all SHARP, ECE2205,Snell 2010, JIS, DOT certifications on a compendium certification. Marginally oversized Kevlar Reinforced Carbon Fibre Shell. Inner EPS lining as per typical crash helmet but thicker with cut out areas to locate ThemaPak (non toxic ammonium nitrate solution encased in protective bag) and halo ‘loop’ inside helmet to distribute cooled fluid.